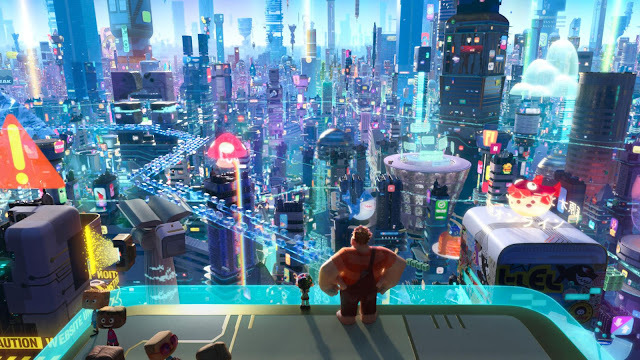 Somehow Walt Disney Animation seemed to forget the premise of the first Wreck-It Ralph film where the mechanics of the video game world and the characters and games were so clearly defined with a ticking clock on their game's survival when characters left. Ralph Breaks the Internet sort of refashions the original with a new mission based on friendship where Ralph (voiced by John C. Reilly) and Vanellope (Sarah Silverman) must use the internet when one of their arcade games is threatened. Co-directors Rich Moore and Phil Johnston create another rich world of both original and familiar licensed characters from other video games and pop culture. Where the first film was stuffed with notable faces, the sequel features tons of popular tech brands through its main setting inside a sprawling physical manifestation of the internet's various corners. The returning and additional voice cast continue to provide colour and commentary on real life including newcomers Gal Gadot as a badass street racer aping her Fast & Furious role and a get rich quick internet huckster voiced by Bill Hader. However, the clear highlights are a couple of extended sequences where Vanellope interacts with all the iconic Disney Princesses (with original voice actresses reprising their roles) who discuss their own archetypes in a contemporary "woke" manner. Johnston and Pamela Ribo's script uses the current state of the online world with social media and internet culture distracting our attention to mine humour. It's a film about the distractions of our interconnected world that also feels like a distraction itself. The message of mutual friendship without being needy, clingy, or possessing one another resonates despite its heavy hand. Sadly, Ralph lacks stakes without a villain in its vast cast of characters where the peril of the lead characters' special friendship is the chief conflict. However, its empathetic story and world-building continue to impress now with the added elements that the internet open up. It's telling that this is Disney's first feature-length animated theatrical sequel in many years. There's just barely enough magic left. By far, the most entertaining parts were the meta references and Disney Princesses sequences that have little to do with the Wreck-It Ralph world proper. While entertaining and mostly endearing, it feels overstuffed but lacking in depth at the same time.